A friend of mine had a supervisor who was a strong advocate of servant leadership. Only in his case, as my friend used to say, that meant “he was the leader and we were the servants.” No doubt that’s not what his superior intended. Still, my friend’s critical, even cynical assessment has some resonance with our text from Luke. As I reflected previously, Jesus’ use of irony about leaders who call themselves “benefactors” reminds us that servant leadership isn’t just a new label for an old style of leadership. Those of us who advocate being servant leaders are always at risk of simply repackaging – and even worse, justifying – leadership practices that are inconsistent with, rather than embodying Jesus’ vision of leadership. What often is associated with leadership – our competency and other’s affirmation of it – is not the heart of leadership. As Jesus teaches, the core of leadership is humility. So what are we to make of the idea of servant leadership? What does being a servant have to do with being a leader? Leadership is usually based on competency. We demonstrate some combination of innate gifts and learned wisdom and experience. Somewhere along the line, we find ourselves in a position of responsibility. Sometimes others invite us into that role. Sometimes we step into a role of our own making. However we get there, others expect us as leaders to demonstrate competency and affirm us when we do. Rightly so. Ideally, we should be the best person for and at our job. Then Jesus comes along and turns our leadership world upside down. The greatest should be like the youngest, Jesus says. Is Jesus serious? What could he possibly mean by this? What is often associated with leadership – our competency and other’s affirmation of it – is not the heart of leadership. As Jesus teaches, the core of leadership is humility. By humility, Jesus doesn’t mean a negation of our leadership responsibility and power. The whole biblical narrative from Genesis forward provides a context in which to understand Jesus’ teaching. God created human beings to exercise leadership – to “have dominion” (Genesis 1:26) and to “rule” (Revelation 4:10) – as God’s image bearers and stewards. Consequently, leadership in its many and diverse forms is deeply embedded in the vocation of being human. So, becoming “like the one who serves” is not, in the first instance, an abdication or renunciation of our leadership responsibilities and power. The critical issue for Jesus is how that leadership is to be exercised. The fundamental question Jesus seems to be addressing is, “What does a truly human leader look like?” History is littered with examples of inhuman leadership – Alexander and Caesar to name two with whom Jesus and his contemporaries would have been familiar. Was the kingdom Jesus inaugurated to be led by people like them? It would have been natural to assume so. Despite Jesus’ teachings and warnings, as the argument which precipitated today’s text illustrates, the early disciples were confused, not unlike many of us today! The appeal of power and popularity as the basis of leadership in Jesus’ day still endures. But Jesus warns us that power and popularity alone leads to a less-than-human version of leadership. At the core of our leadership, if it is to be truly human, must be a commitment to the practice of a radical humility. The apostle Peter is a prime example of how difficult and costly it is to learn this leadership practice. Peter was convinced that he would never deny Jesus even if all others failed him. In many ways, I admire Peter’s commitment and confidence as a leader and follower of Jesus. And, if I am honest, I find myself feeling the same way about my own leadership capacity. Learning to exercise leadership while simultaneously holding lightly my own competency and other’s affirmation of it (and the power that comes from them) is one of the most challenging things I’ve ever encountered. 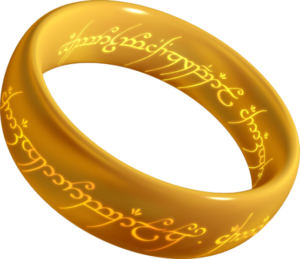 As Tolkien suggests in his Lord of the Rings Trilogy, only a hobbit can carry the Ring of Power. And, even then, a hobbit is still affected by it. Have you encountered good and bad examples of people who claim to be servant leaders? What stood out to you in each case? Does humility seem incongruous to you with being a leader? Why or why not? Why is humility in leadership so important to Jesus? In what ways do you practice humility in your leadership? Where and how do you struggle with it? Lord Jesus, I confess that being a servant leader is often more of an aspiration than a reality for me. I find myself enamored with my own competency and the affirmation of others. It is hard for me to hold them lightly and to see them rightly, as your gifts in the service of the world you create and love. Help me to learn to serve you and others with the radical humility you taught and demonstrated. I ask in your name, Amen. This devotional has been updated from when it was first published on April 23, 2016. Very powerful, convicting, and challenging. I need to spend time reflecting on this. Thank you, Uli.